Attention lovers of bluesy, alt-country, rock mish-mosh bands… this one’s for you! Filled with no-frills twang, sultry rhythms, and classic American melodies, White Hat is worth a download. 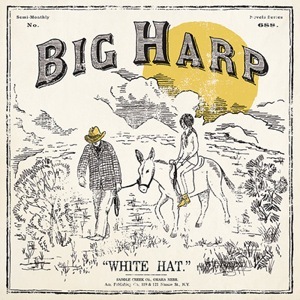 White Hat is the debut album of Big Harp, and is the love-child of Chris Senseney (lead vocals, guitar, keyboards) and Stefanie Drootin-Senseney (bass, background vocals), but it’s not their first. The duo is a married couple with children and two separate musical careers, now merging into an identity of its own. “Steady Hand Behind the Wheel” is a great example of how Chris’ monotone vocals are well-suited to the stripped-down, playful music. White Hat is released this Tuesday, September 13 with a tour to follow. Big Harp: Everybody Pays from Love Drunk on Vimeo.